Apple (AAPL) is preparing to launch a new Apple TV based on the iPhone OS, according to Engadget. The new, smaller gadget -- described as "an iPhone without a screen" -- will face smart TV entrants from Microsoft (MSFT) and the Google/Intel (GOOG) (INTC) alliance announced last week. But contrary to much of the early analysis, the new Apple TV's edge will not be TV-based apps. It will be big-screen gaming. More about the device itself: Engadget says it will stream in high-definition 1080p video, and rely mostly on cloud-based storage, though media will also be accessible from Apple's Time Capsule hard drives. It will have minimal ports, relying instead on wireless to do the heavy lifting, and will probably link to desktop iTunes libraries just like the current version. Apps are designed for small screens, and would require re-release in large, wide-screen format. Few developers are going to be interested in retrofitting their apps when they're busy enough modifying for the iPad. The beauty of apps is that they are touch-manipulable -- in other words, they remove the mouse metaphor and let you jump in and grab what you want on the screen. TechCrunch says they envision people using their iPhones as controllers for their TV apps. Huh? This means the iPhone functions as a giant touchpad, returning to the point-and-click cursor model that Apple has done so much to defeat. Not to mention network issues like pairing, setup and lag. But the real error in thinking is the very same one that TV manufacturers (and service providers like Verizon (VZ)) have been making in the last 24 months: that is, the delusion that TV owners are somehow pining to interact with their TVs in the same way they do computers. It wasn't true in the days of WebTV, and it isn't true now: no one wants Twitter and Facebook on their TV. No one wants their content broadcast in their living room in high-def, for their entire family to see, and no one wants to sit three feet from their TV trying to read status updates in 1080p. Those of us that are interested in using the Web with our TVs have already found a simpler solution: keep your laptop or iPad on the couch. Simple as that. What people are looking for in TV is to be entertained with minimal nonsense: that is to say, they want the best programming with the fewest commercials, the shortest possible browsing and channel-surfing, and the best quality. That's why so many consumers have taken to watching Netflix (NFLX) Watch Instantly, or have hooked up their Hulu-loving computers to their TVs. Apple half-delivers this with the current iTunes Store, but the shows and movies there are way too expensive ($1.99 per episode? Seriously?) and the selection is incomplete. That's why no one cares about the present iteration of the Apple TV. But the real draw to the new Apple TV will be iPhone/iPod gaming. The suspicion that the iPhone will be supplemental to the new Apple TV (a la TechCrunch) isn't altogether wrong -- it's merely misplaced. Pairing an iPhone or iPod touch makes sense, because it's already a paradigm established by decades of video gaming. 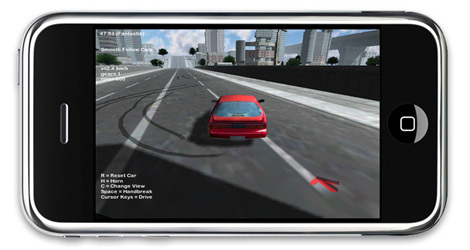 As a game controller, an iPhone or iPod could provide a Wii-like experience: tilt the phone to steer in driving games, or bat it around for something akin to Wii Tennis. There'd still be setup required, and still some lag, but those are issues that gamers already navigate. Porting iPhone OS games to television screens wouldn't take any developer effort, because games are more like videos than they are like apps: reading text isn't such an issue and some pixellation is tolerable, meaning existing games would look fine on a TV. The rest of the experience would be the same as it is today. Choosing games wouldn't happen on the Apple TV itself; it would all still be located on a player's iPhone or iPod, and streamed to the TV via Apple TV. No need for an Apple TV home screen or App Store -- just pair your phone and play. Google and Microsoft haven't announced the details of their TV strategies, but the latter will obviously come to this fight well-stocked with gaming experience and hordes of enfranchised Xbox users. The disruption may hit Nintendo hardest. The Wii and the Xbox have appealed to somewhat different crowds, and both systems have sold well. With Apple in play, the casual-gamer demographic that has lately been Nintendo's province may defect. However things shake out, you can bet that the winningest platforms won't do it with social media or apps -- just plain fun.